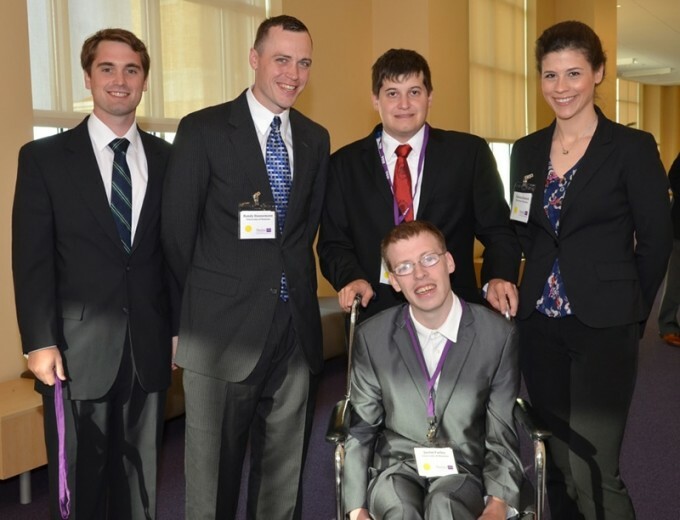 Competitors (from left) Louis McEneny, Randy Hannemann, Adam Trojanowski Justin Farley (front) and Tattiana Reznick from the Wolff Center for Entrepreneurship bested 21 teams during the Richards Barrentine Values and Ventures Business Plan Competition, bringing home a first place win. A group of five students at the University of Houston C. T. Bauer College of Business Wolff Center for Entrepreneurship bested 21 teams at the Richards Barrentine Values and Ventures Business Plan Competition on April 20, bringing home a first place win and a $15,000 grand prize. Competitors Tattiana Reznick, Louis McEneny, Randy Hannemann, Adam Trojanowski and Justin Farley impressed at the competition hosted by Texas Christian University’s Neely School of Business, which included a judging panel of entrepreneurs, investors, marketing and financial experts and venture capitalists. The team presented their business plan for “UNlimiters,” an e-commerce website that sells products to people with disabilities. The competition, which incorporates values, ethics and service into a for-profit business, encourages undergraduate business students to create ventures that have strong business viability, meaning for the organization and significantly improve quality of life. This is the second competition that the UNlimiters has brought home a first place win this semester, with their first win being at the University of Nebraska-Lincoln Center for Entrepreneurship 25th Annual Innovation Competition. Adding to their success, the UNlimiters brought home a second place win from the California Dreamin’ competition on April 28, hosted by Chapman University. This competition had a West Coast, tech-oriented slant with selected teams from BYU, Cal Tech, UC Berkeley and USC. The skills learned through Bauer College classes and the Wolff Center played a large part in helping the team prepare for the competition, Hannemann said.